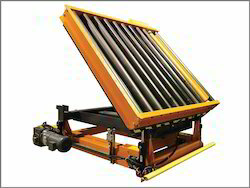 We are a leading Manufacturers & Exporters of custom conveyors from India. Some examples of completely customized conveyors developed by us for special applications include Acid resistant battery assembly conveyor, battery charging tubs, mine conveyors, aircraft loading belt conveyor, baggage trolley conveyor, pan conveyor, concrete conveyor system and many other customized conveyor systems. Our conveyors are custom designed and fabricated as per the needs of the application and can be customized for dimensions, conveying capacity & operating conditions required according to the material to be conveyed. 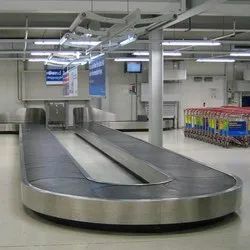 Our Aircraft Loading Conveyors are mobile units for loading baggage into the cargo area. 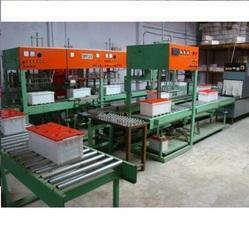 We design and develop conveyors for battery assembly line. The structure of these conveyors is fabricated from special acid resistant materials such as PE & PP. Efficient designs enable minimal system footprint and integrate with other material handling components for a complete, automated system. Fabricated in-house, we can provide slider beds, roller beds, and chain conveyor models. Conveline is the only manufacturer that not only offers a full line of aluminum conveyors, but also a full line of aluminum extrusions, allowing us to develop custom solutions with the right price and lead-time. Regardless of what makes your application unique – temperature, product size and weight, environmental concerns, product handling requirements, line speed or space constraints – contact Conveline today to discuss your needs. We pride ourselves on excellent customer service and industry knowhow – so tell us your challenges and we’ll develop a solution for you. Our concept Baggage Trolley management conveyors are designed for transferring empty trolleys. We offer Customized Solutions that are designed to fulfill the specific material handling requirements of any application. We design and develop the most efficient solution and detail and analyze it with computer simulations for design validation. Our Hanger Conveying System provide automatic solution for transfer and storage of garments. 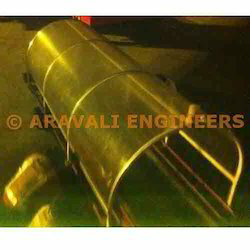 We at Aravali Engineers, Noida manufacture a variety of Steel Belt Conveyors. Namely -Hinged Steel Belt, Slat type, Chain type etc.The structure is a heavy duty steel fabrication. The Conveyor Chain is manufactured from carbon & alloy steel duly heat treated and ground for long and trouble-free performance. The especially cold-formed Steel Slats form a sturdy Steel Belt. For wider and extra heavy duty applications additional pressure pads are provided. Pan Conveyors withstand heavy impact pressure and loads and are ideally suited for handling heavy shredded scrap, forgings & hot castings (up to about 250º C), metal parts etc. 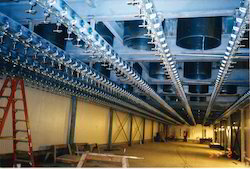 The chain is manufactured from 101.6 mm (4 inch) Pitch, 152.4 mm (6 inch) & 228.6 mm (9 inch) Pitch and the width of the Conveyors can be from 300 mm to 2000 mm to suit customer's requirements. A large number of such Conveyors manufactured by us are working in Foundries, Forge Shops, Press Shops and on CNC Flame / Plasma cutting machines for slag and off cuts handling. Our Sub Assembly Handling Conveyors find wide use in the manufacturing unit for transfer of Sub Assemblies in between operations. These conveyors can be completely customized for length, width, load carrying capacity & operating temperatures depending on the type of sub assembly to be conveyed.